This is a cooking light recipe that I messed with a bit to fit the current state of things. I was worried it would essentially be a potato pancake, but it’s more along the lines of veggie burger… ie it’s pretty hearty food. A little sweet from the sweet potatoes, I could also see this as good food for toddlers or babies who are starting to eat solids. Not that it’s baby food, just that it has a soft-ish texture. But it was pretty good! Nothing that made me gasp with wonder, but a solid dinner that was met with approval from all parties. So stick it in your file for when all the bills are due and you have all of three dollars in your bank account. Cause it took about three dollars worth of ingredients to make enough for four people. Hooray! Also, don’t worry too much about the cuts on the onion/potato/garlic, since it ends up getting blended later. Cook the onions with olive oil until soft and becoming transparent, then add the garlic. Cook until the garlic is just starting to brown. 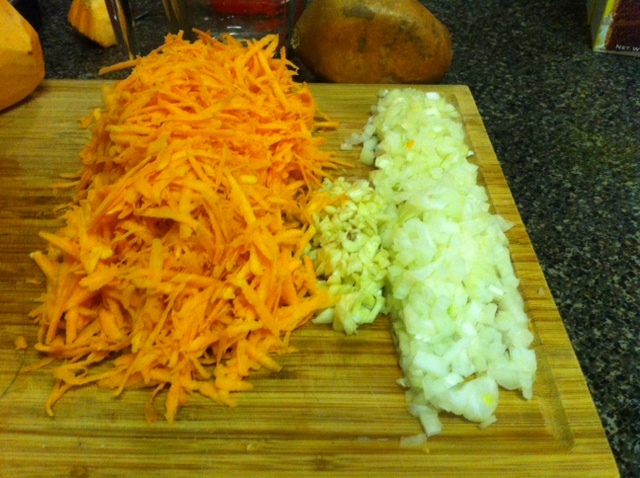 Add about 1/2 a cup of water and 2 tablespoons olive oil, then add the grated sweet potato. Lower the heat to medium low, and cook until potato begins to soften, stirring often. Add the spices, salt and pepper, and lemon juice and zest. It should take about 5-6 minutes. Let cool slightly- to chill faster, spread the mix on sheet pan and move about for a few minutes. Working in halves (with one can of chickpeas and 1 egg at a time), briefly pulse the chickpeas, egg, and sweet potato mix until most of the chickpeas are smooth. You can use a blender or food processor, though it’s easier in a food processor. I left mine a bit rougher since I like to have some texture. 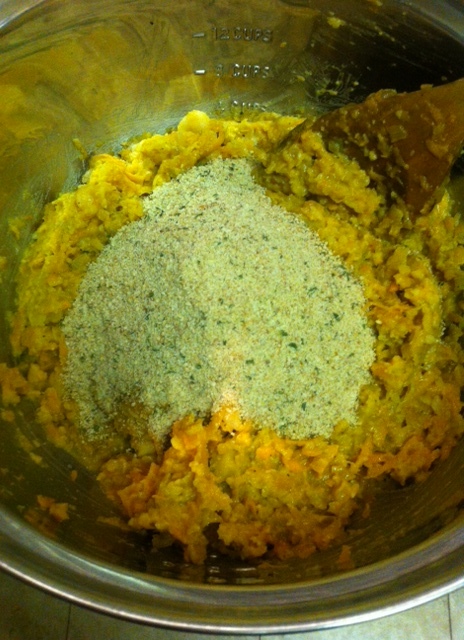 Transfer the mix to a bowl, then add the ground up rice puffs and mix together with your hands. Shape them into “burgers” about 3/4 inches thick and 3-4 inches wide. I got 10 patties, and a good serving is 2 1/2 per person. 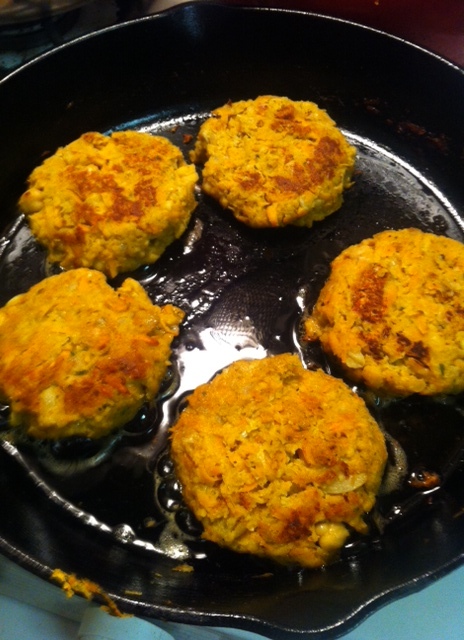 Heat up your pan with a bit of olive oil until nice and hot, then add the patties. I gave it about 3 minutes for the first side, starting on high heat to get a good crust, then lowering to medium low. Flip and cook an additional 7-8 minutes on medium low heat, covered. It’s important to remember that there are eggs in the mix, so it does need to get cooked through. If you prefer baking that’s fine, (400 for 6-7 minutes), but I find preheating the oven just to use for 6 minutes a bit silly. Serve with some sliced avocado or a green salad. Enjoy! What a great idea ad theme! Thank you! I love your site, and the photos are beautiful! Hi Nat: I just saw your site and WOW! I’m so impressed. Love the tone, the info, the visuals. You’ve got it going on! ps And what a lovely thank you note…so rare these days. Thank you.